Due to the size and weight of these products, actual shipping costs may increase depending on your location. These items are not kept in stock at Spiderwebart Gallery, they will be drop shipped from the manufacturer. Because of this, the clocks ARE NOT signed by Greg Hildebrandt. From the Greg Hildebrandt licensed collection, this clock measures 14 inches by 14 inches and weighs in at 3 lb(s). 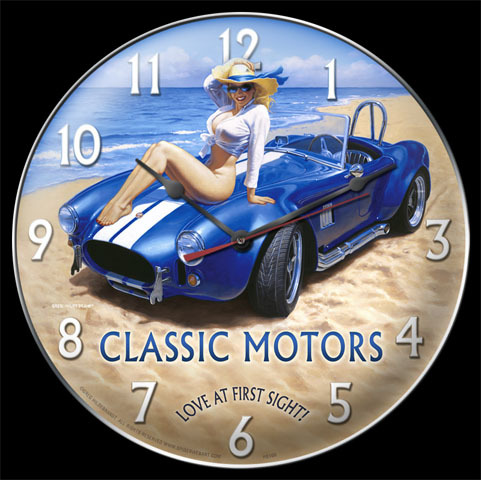 We hand make all of our clocks in the USA using heavy gauge American steel and a process known as sublimation, where the image is baked into a powder coating for a durable and long lasting finish. This clock includes an American made quartz clock movement (requires one AA battery) for years of accurate time keeping and is covered with a clear acrylic lens. This is a great collectible to give as a gift or for your own Pinup/Hildebrandt Collection.